When applying traditional or acid patinas to the Metal Coatings over iron, steel, or aluminum, a primer must first be used to protect the underlying metal from corrosion. This one part primer is recommended to protect the original ferrous surface. This is the quickest curing and strongest primer available for ferrous metals. Practical coverage: 200-350 square feet. This amazing one part, water base, no VOC primer was designed for use in severe industrial environments for the protection of steel structures. It provides excellent chemical, abrasion, and corrosion resistance. Any surface should be cleaned before applying the primer. Spray or brush on. Available in 8 oz, 32 oz and 1 gallon sizes. 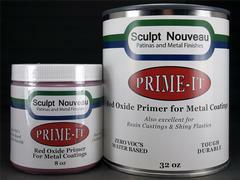 This is also a great product to use over polyurethane products before applying the Metal Coatings.